With over 1,200 applications for cold climate projects, our experience makes the difference. hile many people believe there is an inevitability to oil and gas production in the Arctic Seas similar numbers believe, or hope, that it won’t happen. However, record ice melts over the past few years in the Arctic suggest that these opposing views might not have an Arctic ice pack to worry about in a few decades time. Indeed, The United Nations’ Environment Programme said recently that the Arctic needs to be better protected from a rush for natural resources as melting ice makes mineral and energy exploration easier. In the short term, companies are reconsidering exploration plans. Royal Dutch/ Shell has postponed further exploration offshore Alaska until at least 2014, as it deals with a string of enquiries by various US agencies and departments into its operations. Respected oil and gas major ConocoPhillips has announced it will postpone exploratory drilling plans in Alaska’s Chukchi Sea in 2014, and Norway’s Statoil has also shelved exploration plans in Alaska’s Arctic. Campaigners have welcomed the news, saying that drilling in such sensitive locations is too risky and has huge implications for wildlife and indigenous people. Access to prospective drilling zones is complicated and weather conditions hazardous. However, technology and engineering companies are continually working on understanding the myriad challenges thrown up by working in a globally important parts of the world, from understanding ice and iceberg formation to understanding how we, as human beings, perform in such cold isolation. Shell will have learnt a huge amount of vital, invaluable information about operating under such extreme conditions, useful for itself and the industry. It’s up to the oil and marine industries, environmental campaigners and government to work together to ensure all interested parties have a say in how, over the coming years and decades, the resources are developed safely and precious eco-systems face minimum disturbance. Formed in 1996, the Arctic Council is a high-level forum for political discussions on common issues to the governments of the Arctic States and inhabitants. Its Ministerial meeting this scheduled for May is set to be its most interesting, and controversial, to date. The group’s membership consists of eight member nations with Arctic territories — Canada, Denmark, Finland, Norway, Sweden, Iceland, the Russian Federation and the United States — and six permanent indigenous participants, including the Inuit Circumpolar Council. Currently, The Arctic Council has six ‘observers’, including France and Germany, whom council members have decided can contribute to their work. As Sweden’s chairmanship of the group comes to an end and Canada takes over the reigns, there are signs that the makeup of the group will change significantly. China is among 14 states and organisations, which have applied for observer status, including Japan, the European Union, China, India, Greenpeace and the Association of Oil and Gas Producers. The future makeup of the Council will have a direct bearing on how quickly the Arctic is developed and interest in membership demonstrates just how important the region is for, not only the world’s energy, but environment and climate. It will be an interesting meeting, and a crucial time for the Arctic and its Council! Editor Bruce McMichael editor@frontierenergy.info Publisher Stephen Habermel publisher@frontierenergy.info Design & Layout In The Shed Ltd www.in-theshed.co.uk © 2013 All material strictly copyright, all rights to editorial content are reserved. Reproduction without permission from the publisher is prohibited. 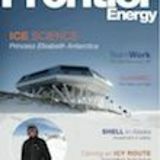 The views expressed in Frontier Energy do not always represent those of the publishers. Every care is taken in compiling the contents, but the publishers assume no responsibility for any damage, loss. The publisher, Renaissance Media, assumes no responsibility, or liability for unsolicited material, nor responsibility for the content of any advertisement, particularly infringements of copyrights, trademarks, intellectual property rights and patents, nor liability for misrepresentations, false or misleading statements and illustrations. These are the sole responsibility of the advertiser. Printed in the UK. ISSN 2047-3702 Published by Renaissance Media Ltd, c/o Maynard Heady LLP, Matrix House, 12-16 Lionel Road, Canvey Island, Essex SS8 9DE. Registered in England & Wales. Company number 5850675. Fram is not only the Norwegian word for ‘Forward’, it is also the name of the one of the first ice-strengthened and most famous polar exploration vessels of the late 1800s and early twentieth century. It was captained by Norwegian explorer, Fridtjof Nansen, a Norwegian explorer, scientist, diplomat, humanitarian and Nobel Peace Prize laureate. Sharing his polar travel experiences with fellow adventurers and scientists, his technology innovations in equipment and clothing influenced a generation of subsequent Arctic and Antarctic expeditions. 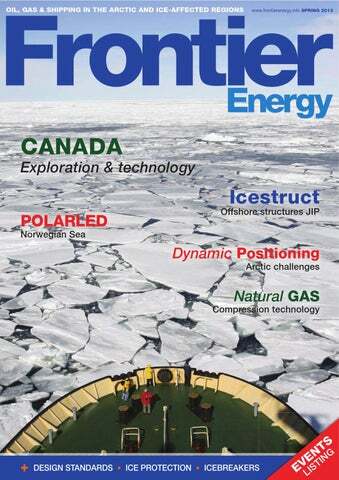 The word encapsulates what we aim to bring you with the magazine – a forward looking guide to the future of oil, gas and shipping activities in the Arctic and other ice-affected regions while keeping environmental protection and safety at the heart of operations. ÀiÊ`ÕÃÌÀÞÊÃ>viÌÞÊ«>ÃÊvÀÊiÛÀiÌÊ>`ÊÃ>viÌÞÊÊ}iiÀ>Ê must be publicly available. Elsewhere, UK-based Cairn Energy is already active offshore Greenland and has drilled eight exploration wells offshore Greenland to date. It will make a decision on its plans to drill another well in 2014 subject to the necessary approvals later this year. Aleksey Chirikov heads for Sakhalin Arctic offshore vessel NB 507 has been officially named after Russian navigator Aleksey Chirikov at Arctech Helsinki Shipyard, in Finland. The vessel has been delivered to Russian shipping company Sovcomflot before it sailed to the Sakhalin area in Far East Russia, where it will supply the Arkutun-Dagi oil and gas field. Arctech has built two Arctic offshore supply vessels for Sovcomflot in this series. This latest delivery was ordered in December 2010. The first vessel of the series, NB 506 Vitus Bering was delivered to the client in December 2012, reaching its destination in March 2013. “The Aleksey Chirikov, will operate in the Far Eastern seas in a region that has been gaining increasing economic importance for Russia over the last several years,” said Esko Mustamäki, Managing Director of Arctech Helsinki. Both vessels are 99.9 m in length and 21.7 m in breadth. Their four Wartsila-supplied engines have the total power of 18,000 kW and the propulsion power of 13,000 kW. As multipurpose vessels, these vessels are capable of carrying various type of cargo and they are equipped for fire fighting and rescue operations. Sea in 2014, and Norway’s Statoil has also shelved exploration plans in Alaska’s Arctic. Shell has spent more than $4.5 billion searching for oil in Alaska’s Arctic seas since it won licences to drill in 2005. Yet its season last year was delayed by problems with equipment, and 2012 then ended dramatically with the grounding of the Kulluk drillship in a storm, while it was towed south for the winter. WesternGeco has begun acquisition of its Ice Bear 2 multi-client 3D survey in the western Barents Sea using its new IsoMetrix marine isometric seismic technology. The isometric inline and crossline sampling delivered by the IsoMetrix technology will provide high-resolution broadband imaging in this geologically complex area, said the company. “The Ice Bear 2 survey, which is supported by industry prefunding, will improve the understanding of play potential and economic viability for hydrocarbon production in the region,” said Celine Blachere, vice president, Europe, Africa, Russia and Caspian, WesternGeco. Ice Bear 2 lies to the north of the WesternGeco Bjørnøya Ice Bear and West Loppa 3D seismic survey areas where the Havis and Skrugard discoveries were made. Exploration and production activities in the region have increased as a result of these and other discoveries in the area. If all the ice in the Arctic melted, the global sea level would rise about 24 feet. If all the ice in the Antarctic melted, it would rise about 200 feet. Russian partners Royal Dutch/ Shell and Russian gas giant Gazprom have agreed to team up for upstream activity in Russia’s Arctic shelf and a section of deep-water shelf abroad, and develop shale oil opportunities. “Gazprom and Shell already partner in the Russian shelf development. The new accords enable us to explore the potential of our joint capabilities,” said Alexey Miller, Gazprom chairman. The companies will set up a joint venture to deal with new projects for oil shale exploration and development in the Khanty-Mansiysk Autonomous Area. The joint venture where each company will hold a 50 per cent stake will be registered in Saint Petersburg. Besides, Gazprom Neft and Shell assume that Salym Petroleum Development with shareholding split on a parity basis will operate new projects at the first stage of cooperation. Falklands seismic A joint venture including FOGL, the oil and gas exploration company focused on searching south and east of the Falkland Islands, in the southern Atlantic Ocean has completed a 3D seismic survey over the Diomedea Fan area using the Ramform Sterling vessel. Over the next two years FOGL plans to invest US$160m in exploration offshore the Falkland Islands acquiring over 10,000km2 3D seismic date. The survey was operated by Noble Energy on behalf of the joint venture, which includes Edison International and FOGL The data is now being processed by seismic company PGS, owner of the Ramform Sterling, and will be available in late 2013. A second 3D seismic survey, also using the Ramform Sterling, started in April. This survey will cover a minimum area of 1,000 square kilometres and will target a number of prospects and leads in FOGL’s southern licence area, immediately to the west and north-west of UK junior Borders and Southern Petroleum’s Darwin gas-condensate discovery. The jv is also currently reviewing tender offers with respect to a third 3D seismic survey to be acquired in the northern licence area in late 2013. Starting in mid-2014, FOGL’s partner Noble Energy is expected to drill three or four exploration wells. Norway has cleared the way for an environmental impact study in a key area in an environmentally sensitive area in its Arctic lands. At the same time, oil and gas exploration in the waters around the Lofoten islands just above the Arctic circle is becoming one of the most contentious issues for parliamentary elections in September. Oil companies have not previously been able to search for hydrocarbons in the area as it hosts important fishing grounds with huge cod stocks and is an important area for tourists. Norway’s oil production will fall to a 25-year low this year as North Sea fields mature. Even a series of recent big finds, like the giant Johan Sverdrup field which could hold over 3 billion barrels of oil, will only slow the decline, hence waters further north are now being considered for upstream activity. stimates suggest that approximately 35% of Canadaâ&#x20AC;&#x2122;s remaining marketable resources of natural gas and 37% of remaining recoverable crude oil lies in northern Canada. Of particular interest are the offshore resources present in the Canadian part of the Beaufort Sea, located just off the coast of the Northwest Territories. While this region of Canada is attracting the interests of a range of new players, both commercial and political, interest on its own is not sufficient for any rapid development to take place. As this article will outline, there are several factors that may restrict the viability of Canadian Arctic oil and gas despite its ostensible opportunities. intensified. A total of 86 wells were drilled from 1972 until 1989; an impressive number given the harsh conditions and uncertain commercial prospects of the area. However, although several Canadian companies had been active in promoting the petroleum potential of the Beaufort Sea, the Arctic was mostly abandoned from the mid 80s as oil prices fell and transportation of any findings became problematic. federal levels openly favor oil and gas development in the Arctic, there is less leveraging of these interests in comparison to other parts of the Arctic in which oil and gas discussions are taking place. Conclusion By contrast to oil and gas development in the European Arctic and other areas of North America, development in the Canadian Arctic appears less defined in terms of commercial viability. Moreover, regional and federal-level interests are vocalised less strongly than those encountered in neighbouring Alaska. Should large quantities of recoverable oil or gas be discovered in the near future, this situation may change rapidly. Nonetheless, the challenges described above – relating to price levels, transportation, and a lack of national interest – will continue to weigh upon development in the short to mediumterm. It is reasonable to conclude that development of the Canadian Arctic is still only a possibility and not a given, even in the context of strong and increasing commercial and political interest. questions concerning the commercial viability of Canadian Arctic gas projects, in which the cost of extraction often does not warrant activity. he Canadian government has signed a $288 million contract with Irving Shipbuilding for Arctic/Offshore Patrol Ships (A/OPS). The definition contract will allow Irving Shipbuilding to design the ships and their electronics and mechanics up to a production level. A separate contract will be awarded for the construction of the ships, which is expected to begin in 2015. The first ship will not be operational until 2019, and the fleet will not be fully operational until 2023 — a full 17 years after Prime Minister Stephen Harper pledged during the 2006 election to acquire three icebreakers. Long term focus “Our focus over the next 30 months is on producing a detailed ship design that delivers best value to Canada, while ensuring we meet the government’s 2015 deadline to cut steel for the first ship – this is vital to our customer, our current workforce and their families,” said Ross Langley, vice chairman of Irving Shipbuilding. Irving is expected to begin tendering for C$300 million ($292m) in infrastructure upgrades at the Halifax Shipyard, to prepare the yard to build the AOPS vessels in 2015, as well as the larger combat ships currently scheduled to begin production in 2020.
bio-accumulate in animals and plants,” explained Dr. Hawboldt. The primary advantage of the small MIP-based devices is their sensitivity and selectivity. When deployed into a marine environment, the MIPs will only detect targeted compounds, such as phenols, heavier polycyclic aromatic hydrocarbons and other compounds that are toxic to the marine environment, while avoiding irrelevant compounds, ensuring accuracy. xxonMobil Canada Properties has released the option for Kvaerner’s joint venture company Kiewit-Kvaerner Contractors to provide the full scope of engineering, procurement and construction (EPC) services for the Hebron roject gravity based structure (GBS). The contract value for Kvaerner’s share of the full EPC contract is approximately $1.5 billion and includes work conducted to date on the Hebron project. The Hebron oil field lies offshore Newfoundland in the Jeanne d’Arc Basin southeast of the city of St. John’s. for Sakhalin Energy; the Adriatic LNG terminal installed in 2008 outside Venice in Italy, and the Arkutun-Dagi GBS for the Sakhalin-1 project constructed in Nakhodka, Russia and delivered to Exxon Neftegas Limited in June 2012. Hebron development The Hebron oil field is located offshore Newfoundland and Labrador in the Jeanne d’Arc Basin 350 kilometres southeast of St. John’s. The field was first discovered in 1980, and is estimated to contain 660-1,055 million barrels of recoverable crude oil. The field will be developed using a stand-alone concrete gravity based structure (GBS). The structure will consist of a reinforced concrete structure designed to withstand sea ice, icebergs and meteorological and oceanographic conditions. It will be designed to store approximately 1.2 million barrels of crude oil. The Bull Arm site is the primary construction site for the GBS. The GBS will support an integrated topsides deck that includes a living quarters and facilities to perform drilling and production. A substantial portion of the topsides will be engineered and fabricated in Newfoundland and Labrador, and the integration will be performed at the Bull Arm Site. The project includes offshore surveys, engineering, procurement, fabrication, construction, installation, commissioning, development drilling, production, operations and maintenance and decommissioning. Sense and understand The focus has been on developing technology and expertise that enables shipping offshore and energy companies to sense and understand how the sea around their assets is behaving and to make plans to manage problems, for example ice floes and other small targets in the sea, for example small, fast moving pirate boats offshore the coast of Africa. Elsewhere, the company has recently trialled ice edge discrimination, open water detection and navigation in icy waters technology and techniques with the US Coast Guard. The company is also testing fleet-wide selection of oil spill detection capability with a national oil company, and with a geophysical survey company for fleet-wide selection of small target detection capability. Exceptional perfluoroelastomers for extreme low temperature sealing applications Perlast® ICE G90LT offers a unique combination of excellent chemical resistance, explosive decompression resistance and low temperature capability down to -46°C. Perlast® ICE G90LT is a revolutionary high performance perfluoroelastomers (FFKM), developed for use in equipment stored or operated at sub-zero temperatures. ARCTIC JACK-UPS, DRILLSHIPS, SEMI- SUBMERSIBLES & VESSELS. GustoMSC is a leading design and engineering company for all types of mobile offshore units: jackups, semi-submersibles and offshore vessels. Our business approach is to deliver proprietary designs under license and associated equipment like jacking systems, skidding systems and offshore cranes to the market. be achieved entirely subsea by using the breakthrough technology promised by the subsea pilot plant? The benefits of opting for subsea compression for Ormen Lange or any other gas field are numerous. Capital and operating costs of a subsea station are more economical than those for a new deepwater compression platform. Another key advantage is that by locating the compression system on the seabed near to the subsea gas wells, the back pressure exerted on the gas reservoir will be much reduced, enabling greater production to be achieved. Full-scale pilot Subsea compression is not a new concept, but despite the concept being mulled over by the industry for decades, it was not until 2006 that Aker Solutions won the first contract to take development forward by designing and building the first full-scale pilot system. The Ormen Lange pilot was built throughout 2010 at Aker’s Egersund offshore construction yard, in a new purpose-designed fabrication hall. The pilot consists of eight large subsea modules, grouped to form process, control and high voltage power systems. Together these make up a single full-sized compression train. The modules for the pilot contain the essential equipment for solving the technology challenge. The entire system was put through months of testing at Egersund, before being disassembled and shipped to Nyhamna for reassembly in the 42 x 28 x 14m deep test pit, where it is currently being put through its paces on ‘live’ Ormen Lange gas and condensate. At the heart of the pilot is our GasBooster compression module, housing a compressor, a compact 5m high vertical centrifugal machine which will operate at 11,000rpm. The compressor and its high speed electric drive motor are housed in a single, hermetically sealed enclosure which is pressurised with a barrier system to keep the motor and compressor spaces separate, and also to ensure clean operating conditions for the motor and bearings. ÀiÊ structure who has no specialised knowledge of ice mechanics is provided with a basis for determining characteristic ice load effects. iÊ`iÃ}iÀÊÃÊÌÊÀiµÕÀi`ÊÌÊ actually perform probabilistic analyses, since the framework provides simplified deterministic solutions that take uncertainty into account. Arctic co-operation DNV and Statoil have launched a competence programme to enhance the two organisations’ knowledge about particular Arctic challenges. “Due to Arctic-specific risks such as remoteness, darkness, ice and low temperatures, it is utterly important to take a stepwise approach in which we learn and improve from the experience gained. Our complementary roles as operator and risk-management expert in challenging environments are the best reason for sharing best practices and enhancing our own expertise,” says Knut Ørbeck-Nilssen, COO DNV Norway, Finland and Russia. The growing interest in the commercial use and exploitation of Arctic resources is driven by the high demand for energy. To be able to meet the particular Arctic challenges with sound knowledge and safe technologies, Statoil and DNV launched its Arctic Competence Escalator (ACE) programme. This has been developed to enhance the expertise of our own specialists and to share and improve solutions for specific Arctic issues. “We will implement the ACE Programme as a joint effort because we have similar ambitions and backgrounds. We have a long history of successful technology collaboration. Although this is an internal programme, we aim to share our developments with the industry,” says Ørbeck-Nilssen. “Statoil already has many years of experience of Arctic offshore operations, for example in the Barents Sea and at Newfoundland in Canada. But the Arctic is a highly diverse part of the world and operating in the more challenging areas, with longer distances, lower temperatures and ice-covered waters, may require enhanced knowledge and solutions. I hope the ACE programme will be an important driver in obtaining these. Deep insight matched with respect for the Arctic’s particular conditions will be necessary to manage the risks in this promising but sensitive part of the world,” says Morten Karlsen, head of Statoil’s Arctic Technology Research Programme. is based on the continual development of financial and health and safety new elastomer materials combined with implications for exploration companies. exceptional levels of customer service and A number of seal manufacturers have technical support. their elastomers tested to the NORSOK Last year PPE launched a new range M710 Annex A (ageing of elastomeric of low temperature elastomers with one materials) standard to predict the il and gas engineers are faced material specifically developed for oil and useful life of seal materials in sour with the continual problem gas applications. Perlast ICE G90LT is the gas environments. The minimum test of how to extract oil and gas first and only perfluoroelastomer (FFKM) parameters are 2% H2S and a minimum from evermore demanding environments, on the market that of three test safely and cost effectively. The main simultaneously temperatures which problems faced by engineers are extreme offers low are “above service The higher the temperature the high pressures, extreme high and low temperature temperature” more aggressive the chemical temperatures, explosive decompression capability down to with no actual and aggressive chemicals which can attack -46°C (-51°F), high temperatures attack on the elastomer the equipment and components used in pressure and rapid specified. the upstream process. gas decompression Temperature has a For nearly 40 years, this has been (RGD) resistance, as well as superior significant effect on the results. The higher the battleground for Precision Polymer chemical resistance including high the temperature the more aggressive the Engineering and the company is now concentration sour gas. chemical attack on the elastomer. at the leading edge of developing and Sour gas (hydrogen sulphide or H2S) As a general rule, for each 10°C manufacturing specialist sealing solutions can have very detrimental effects on increase in temperature, the rate for hostile environments, especially for elastomers, non-resistant elastomers will of chemical reaction doubles. Therefore use in the oil and gas industry. Founded in become hard and brittle, losing their engineers must be satisfied that the elastic properties and their ability to seal, NORSOK certified sealing material they 1975, and based in the UK, PPE has sales ultimately leading to seal failure which have selected is tested to a temperature offices and dealers in North America, can have significant environmental, which is representative of their “real life” Europe and Asia. The company’s success service conditions. PPE have recently received independent test results for a number of their leading PPE in Houston oil & gas materials grades, including Perlast ICE G90LT, conducted at elevated temperatures and high concentrations Precision Polymer Engineering (PPE) has opened a new test and customer support facility in north Houston, Texas. (25%) sour gas with outstanding results. The new 7,232 sq ft sales, customer support, warehousing, training and test facility consists These tests parameters are more of office space, meeting rooms, a test and material analysis facility (including high pressure representative of real-life service test equipment backed up by all the test and analysis facilities in the UK) warehousing and a conditions and seek to find the limits customer support centre. PPE will also be delivering regular courses on “Elastomer technology of the elastomer’s capability and give & seal design for oil and gas applications” in the training suite. The vision is to provide world engineers a level of comfort for the design class technical and engineering support focusing on solving advanced sealing problems, limits in a given sealing application. materials support and test facilities at the heart of the US oil and gas industry. PPE: 5FM 	 : contact the PPE Application Engineering department. States, Canada, Norway, Denmark, Iceland and Finland, converse openly on all regional issues, both the challenges and the opportunities. in infrastructure, it could revolutionise global trade since it cuts the distance by Western Europe and East Asia by a third. The implications of this could be immense, re-drawing the global map of shipping. Huigen Yang of the Polar Research Institute of China commented that “There is special significance to China with regards the Northern Sea Route. It will mean shorter distances to Chinese ports and lower C02 emissions.” If true, that would be welcome news to many environmental experts. But the route still throws up plenty of challenges. Christian Bonfils, Partner and Managing Director, Nordic Bulk Carriers A/S, despite seeing the potential in the region doesn’t believe that it will rival the Suez canal just yet. n open water, dynamic positioning (DP) involves a series of computer controls that issue position-related commands to maintain a ship’s position and heading. There, it is a well-known strategy used for many years. But in the arctic, DP philosophies and strategies are different and also include ice-management. breaking point of the ice, you won’t see a reaction,” he explains. Typically, a second ice-breaking vessel accompanies a drilling or other vessel about a mile ahead. It travels from side to side or forward and backward to pre-break the ice. Sometimes a third icebreaking vessel also is needed to further break the pre-broken pieces into even smaller floes before the vessel that does dynamic positioning can stand. Tugs pull icebergs (or pieces of them) that approach the DP vessel aside and change their course by 1-2 degrees to avoid collisions. Staying in position when ice starts to move is a problem. It’s nearly impossible, and the forces required to do so are much higher than in open water. Kuehnlein mentions the ice forces in one ice field in the North Sea has more than 10,000 tons horizontal load. In these extreme cases and in heavy ice conditions, forces needed to stay in position are more like 50 to 100 times greater than in open water. No propulsion system can deliver such a pull, so vessels are connected to strong mooring systems. The biggest problem is that ice rapidly moves and it changes direction. Staying in position when ice starts to move is a problem stops) you wouldn’t do anything, you would just stay there. In ice, you have to break as large an area around you. If it starts to move again, it may move in a totally different direction and you need a pre-broken area to turn the bow towards the drifting ice in a short time. With DP, there is a lot of activity and preparing. In open water, you relax. In ice, you work hard to move in a new direction, and constantly move backward and forward. But, in ice, you don’t have an ‘overshoot angle’ problem that you do in open water; when you drop the power, you stop immediately. With DP, you commonly reduce power slowly from 100%. Challenging but possible DP work is important and needed now. Drilling for mineral resources in light to moderate ice conditions could be done with dynamic positioning. Kuehnlein says the industry made a little progress on in the 1980s, but they didn’t have the technologies of today. “Now, the entire operation is different; we need to have evacuation systems, possibilities for oil recovery, spill containment, other vessel requirements and means in place to handle disasters. It’s challenging now, but we couldn’t have succeeded 20 to 30 years ago”. The community working on these issues has a few hundred people. The demand is increasing much faster than the knowledge, which Kuehnlein says can be a problem. “We have much less experience with dynamic positioning in ice than with it in open water. The models are rougher, but they need to be more robust than in open water. It’s a big challenge. In ice you need 10 times more power, but have 10 times less experience and 10 times fewer people. It’s 1,000 times more complicated,” he adds. Debbie Sniderman is CEO of VI Ventures LLC (vivllc.com), a technical consulting company. This article appears courtesy of ASME. o protect such ice-going vessels Ecospeed, part of the Belgiumbased Hydrex Group, has developed a glass-flake reinforced surface treated composite (STC). The coating is non-toxic is thus practical for ice trading vessels where toxic anti-friction coatings are rapidly scraped off and deposit their toxic ingredients in what are often particularly sensitive environments. W&R Shipping converted its existing fleet to Ecospeed and specced Ecospeed as the coating for newbuilds ordered. Based in Zwijndrecht, The Netherlands, W&R Shipping provides ship and fleet management services and builds multi-purpose vessels in China, partly on commission. December 1999, and by August 2007 it was time for her second intermediate survey – her third drydocking. “We knew that sooner or later we were going to have to do something, so we decided to go with Ecospeed.” They removed what remained of the existing high abrasive coating and applied Ecospeed to the entire underwater hull and rudder. The Thea Marieke followed in the wake of the Crownbreeze with an Ecospeed application in 2008. Those were the two where the original coating was replaced. Subsequently, the Crown Mary and the Tina both had Ecospeed applied at newbuild stage, the optimum time to apply the coating. Wim explains that, from a preparation point of view, he found it easiest to apply Ecospeed to new steel. The required surface preparation is easier to accomplish at the shipyard in the construction stage than in drydock after the ship has been in service for some time. Proper preparation and application are vital to the success of the Ecospeed coating. The only ship of the W&R fleet not currently coated with Ecospeed is the Monica, an older vessel which may be sold in the future. didn’t need to do anything with the hull paint in drydock.” The Crownbreeze was docked in 2009 and again in 2012, five years after the Ecospeed was applied. Nothing had been done with the paint in the 2009 drydocking. Because of the different dock block positions, the 2012 drydocking was an excellent opportunity to coat the parts of the hull previously missed due to the dock block position when the Ecospeed was originally applied. “We touched up a total of about 90 sq. m. of the hull which has a total area of about 2,000 sq. m. 60-70% of that was the dock blocks and the remainder was mechanical damage mainly from poor fendering in some of the ports the ships visit.” With the new ships, Wim insists that they are reblocked before the coating is finished so that there are no gaps in the coating as a result of the dock blocks, but with ships already in service the time and expense prevent that. Based on the experience with touching up the paint on the first two ships in drydock, Wim is working out the most efficient way to get the touch-ups done for future drydockings. The next opportunity will be with the Thea Marieke which will be drydocked in 2014. By then she will have sailed for six years with Ecospeed and Wim is very interested to see how the hull coating has held up. NOIA’s Annual Conference is the region’s largest, most important oil and gas industry event, with over 1,100 delegates and internationally renowned speakers, it is a must-attend event for anyone wishing to do petroleumrelated business in east coast Canada. Oil and gas exploration is going farther, deeper, colder and the Arctic Region is the next frontier. Well positioned to meet the challenges of working in this harsh environment, Newfoundland and Labrador is the ideal location to examine the prospects and opportunities arising as oil and gas companies look north for future development. The Conference will include project updates and outlooks from the region’s operators and will provide unparalleled networking opportunities to delegates. Visit www.noiaconference.com for conference details. 4 5 Key Arctic information and data 6 Linked to our exclusive eNewsletter! CHILE Chart courtesy of US Coast Guard, www.uscg.mil. KEY Vessels were selected and organized based on their installed power measured in Brake Horse Power (BHP). Vessels with less than 10,000 BHP were not considered to be capable of independent arctic operation. Vessels are ordered by age, youngest first, within power groupings. Vessel outlines reflect relative sizes. he expert assessment was a mix of optimism and measured concern: where some accounts have predicted a new era of geopolitical conflict or even a militarized Arctic, the speakers instead suggested that international cooperation in science and diplomacy is already reducing the risk of conflict in the region. Of greater concern may be a lack of US preparation to deal with the coming changes: rapid advances in development, threats to indigenous populations, and accelerating climate change so powerful that some researchers warn that it could destabilize climate patterns across much of the globe. The decline in the Arctic’s summer ice cover is “definitely outpacing what a lot of our worst-case climate models have been suggesting would happen...as we continue to warm the planet,” said Julienne Stroeve, a researcher based at the US National Snow & Ice Data Center in Boulder, Colorado. “The changes are happening a lot faster than expected and there are a lot of implications for governance and (resource) exploration.” “I don’t think we have a strategy, an agreed-to national plan,” added Heather A. Conley, senior fellow and director of the Europe Program at Center for Strategic and International Studies in Washington, D.C. “How much are we going to develop the Arctic? How much are we going to protect it? We’re going to be testing the system across the Arctic and testing international cooperation to make sure that we can work together and not at cross-purposes”. used to be covered permanently by ice are now becoming open water in summer. Climate models suggest that the Arctic Ocean will become ice-free in summer by 2050, she said, while other models say it could happen even more rapidly, as early as 2020. For most people in more populated parts of the planet, the Arctic feels far removed from daily life. Still, even from a distance, it’s evident that far-reaching changes are underway. Last summer, news reports detailed how sea ice levels in the Arctic had reached yet another new record low. In November, a Norwegian tanker ferried a load of liquid natural gas to Japan across an Arctic route that is usually frozen at that time of year. And in Greenland, Conley said, the number of Chinese mining workers in the decades ahead is likely to outstrip the country’s current population of 57,000. At first glance, the receding sea ice would seem especially alluring to oil and gas companies that, Hamilton pointed out, have been producing oil and gas near or above the Arctic Circle for nearly 90 years. The U.S. Geological Survey has concluded that about a quarter of the Earth’s remaining hydrocarbon potential lies in the Arctic. About 70% of it is gas, and 30% oil. But Jed Hamilton, senior Arctic consultant at ExxonMobil’s Upstream Research Company, said it’s too simple to think that receding summer ice will lead to a massive new rush of oil and gas exploration and drilling. The projects still face enormous challenges: severe winter weather, including crushing sea-surface ice floes; technical and engineering challenges in getting the crude or gas to refineries and to market; and huge production and transportation costs. “In the end,” he said, “Arctic hydrocarbon resources will have to compete with other energy sources and must demonstrate favourable economics under a long-term price forecast in order to be developed.” He offered a sobering example: ExxonMobil and its partners are beginning development of a 1 billion-barrel oil field off the northeast coast of Canada. “It will take us five years and north of $10 billion to develop that field,” he said. The oil will be extracted over a period of 40 years, he added, “and when all is said and done and people have spent their entire careers on that project, that 40 years of production will satisfy 12 days of world demand right now.” While the Arctic oil and gas projects are challenging, Hamilton suggested that, over time, escalating global demand for energy of all types will drive prices higher. And that will create strong incentive to undertake such projects. NEW FRONTIERS! NEW TECHNOLOGY! NEW CHALLENGES! to the oil & gas and shipping operations in the Arctic and other challenging ice-affected regions. Each issue will offer an exclusive insight into the technologies being used to overcome the challenges of this unique environment. Supported by a weekly e-newsletter, and up-dates on all the latest developments. Connect with your existing customers and reach new ones through the pages of the Frontier Energy. Frontier Energy is your essential guide to these new markets!